WELCOME Friends, old and new, to the FOURTH house (or we should say HOUSES) on the 2012 Holiday House Walk Tour! 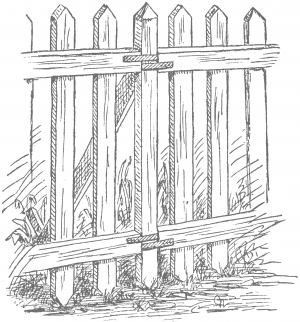 We are Heather and Vanessa of At The Picket Fence and we were ecstatic to find out we were the next stop on the tour after our dear friend, and surprise tour house, KariAnne of Thistlewood Farm! Have you EVER seen such a gorgeous farmhouse?! We are so honored to be joining in with some of the most fabulous homes and blogs on the web and we want to thank Jennifer for inviting us to participate. So we throw open the doors and welcome you to our homes! Up first we ask you to walk on in the front door of Heather’s country home in the heart of the rolling hills of Kentucky. Welcome to my country kitchen, the heart of our home! Many of you know that I recently remodeled our kitchen and this is the first Christmas we have celebrated with it completely done! I’m in love with every detail of it! The white cabinetry, beadboard backspash and dark counters, make it the perfect canvas for the bright reds, fresh greens and vintage touches I love. I decided to go simple this year, with my “birds of a feather” Kitchen tree, nestled an red metal bucket. I love using fresh evergreen and these mini trees fit the bill! I love the tiny book page Christmas trees resting on antique spools, and my vintage kitchen scale was the perfect place to stack these bright and fun mini ceramic loaf pans. 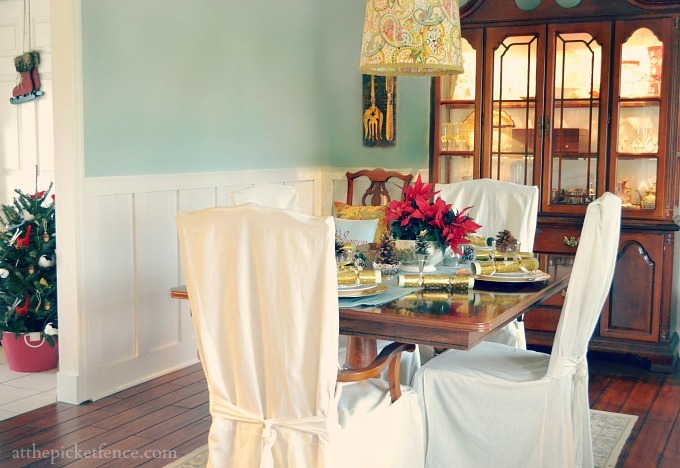 Right off our kitchen is our formal dining room that also recently had a complete transformation. Fresh red poinsettias nestle in a tureen brought back years ago by my mother-in-law from Shakespeare’s birthplace, Stratford-upon-Avon. My snowflake wreath from Christmas 2011 has held up for another holiday and is right at home on my framed chalkboard. 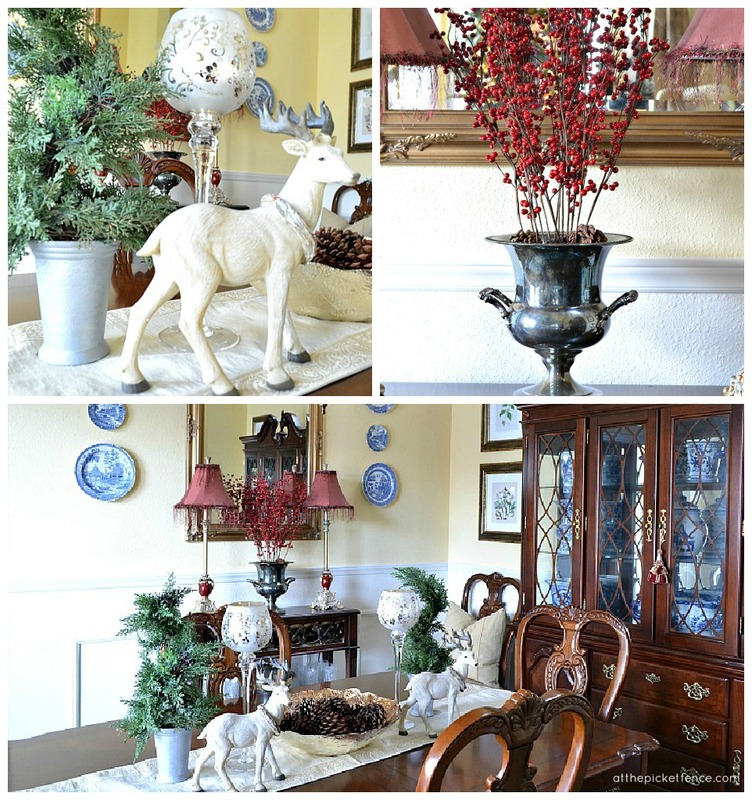 Pinecones placed in vintage silver goblets and a sweet little vignette of bottle brush trees in an apothecary jar round out my dining room holiday decor! Since my powder room is located right off the front hallway, I knew it needed to get in on the Christmas decorating action. 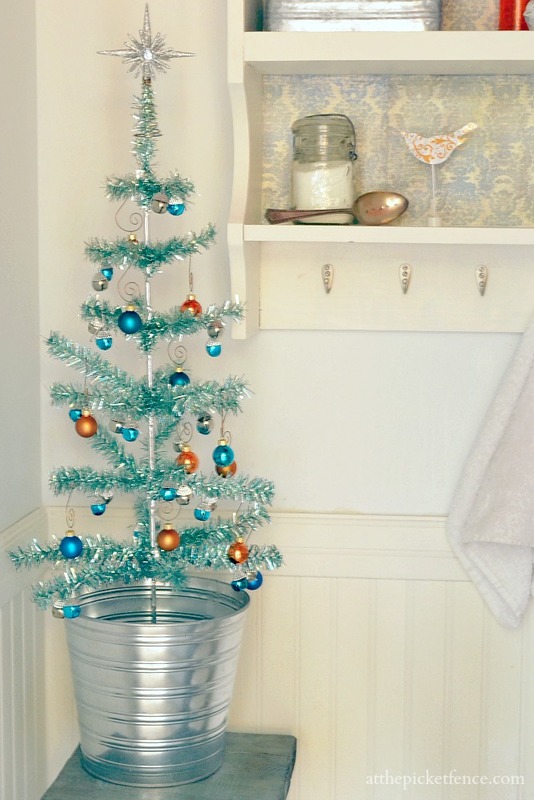 I picked up this darling little turquoise tinsel tree last year at Christmas, and it seems right at home in a galvanized bucket on this industrial stool. Of course I had to decorate it with tangerine ornaments to tie in my tangerine ceiling! Painting my mantel is one project I still have yet to do, so instead of fighting the brick and wood I decided this year to compliment it by decorating the living room in browns, metallics and blues. 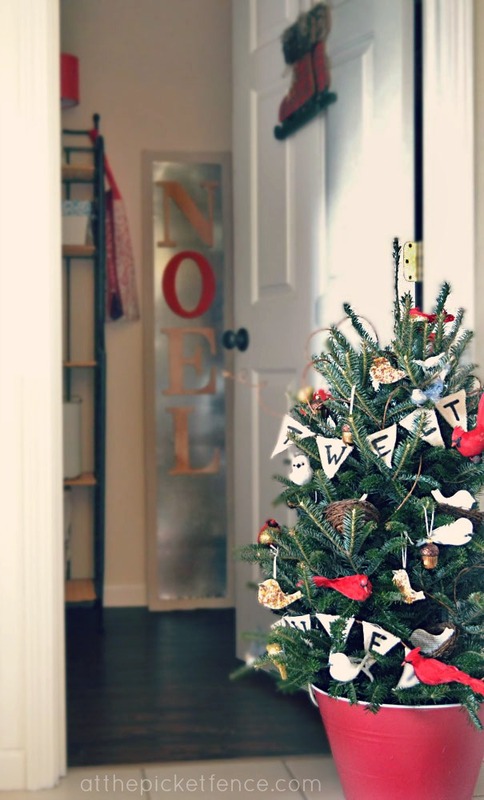 I love these whimsical trees and my faux galvanized JOY letters. This is the second year I’ve placed my tree in this large copper pot, and I love the streamlined look! Again, going with the theme of simplicity this year, I allowed the mantel and my flocked tree to take center stage in our great room. 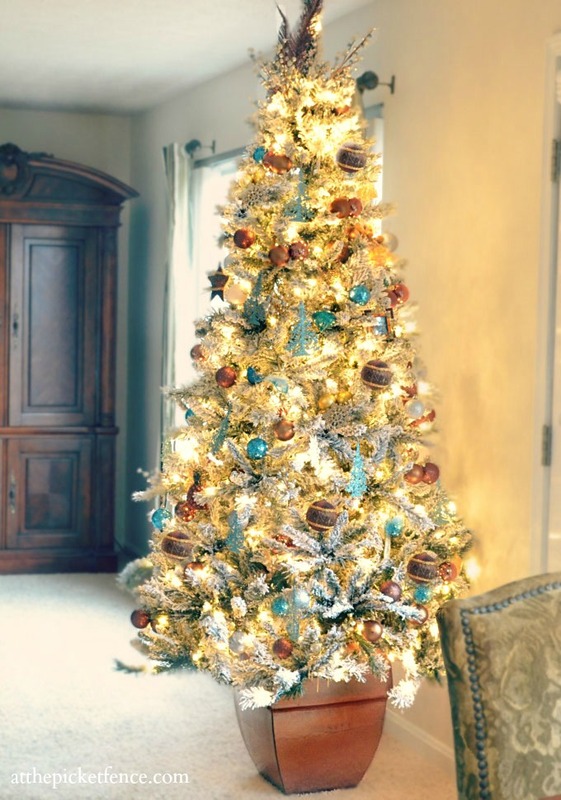 Thank you so much for taking a little mini holiday tour of our Kentucky home, up next we’re headed to Vanessa’s house in the Pacific Northwest where she’s sharing some of her favorite holiday rooms! Welcome to my home in beautiful Oregon! I’m so thrilled to be apart of this Holiday House Tour and just wish I could literally invite you all in for some cider…or eggnog…or a pumpkin spice latte…which technically you’d have to pick up at the nearest Starbucks before coming over, but you get the idea, right? I may live in the land of logging and flannels but my home is a nod to the traditional all the way! The first room on your left when you come through my front door is the living room. I love color and my home is a reflection of that but this year I decided to offset things by going with a more creamy palette. I was so excited when I opened up the bins in the attic (after having several “Chevy Chase” moments and knocking my head on the beams over and over!) and discovered some glittery Christmas trees I had gotten on clearance last year. 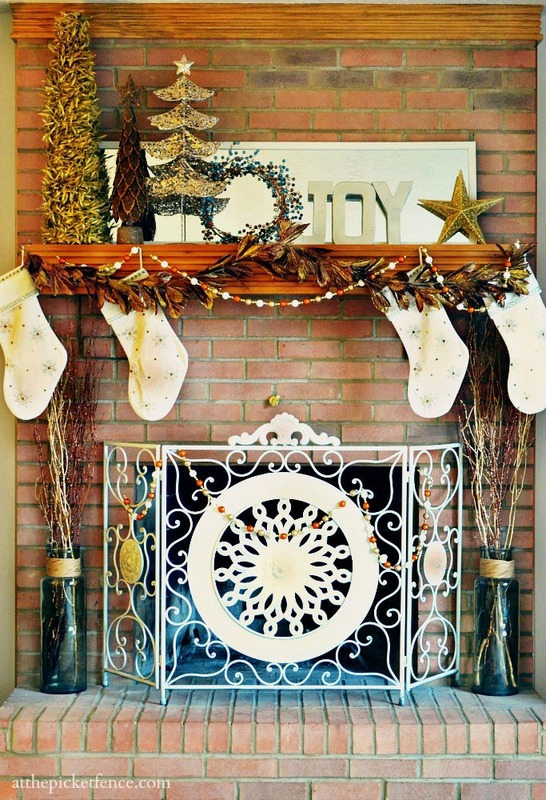 It made my mantel decorating so much easier! I was also thrilled to score this beautiful mirror at the Habitat for Humanity ReStore in early November and I knew it would be the perfect addition to the room just in time for Christmas. If you were to walk in the front door (pumpkin spice latte in hand!) you would be greeted by my favorite feature of our home, my staircase. It will be getting a bit of a face lift the first of the year but for now it is accented with giant pine cones, greenery and simple bows. My dining room is just beyond the living room and the traditional feel continues. The furniture in this room is among the very first we bought as newlyweds and while it goes slightly more formal, it fits perfectly with the architecture and style of our home. So don’t expect to see it getting a coat of chalk paint anytime soon! 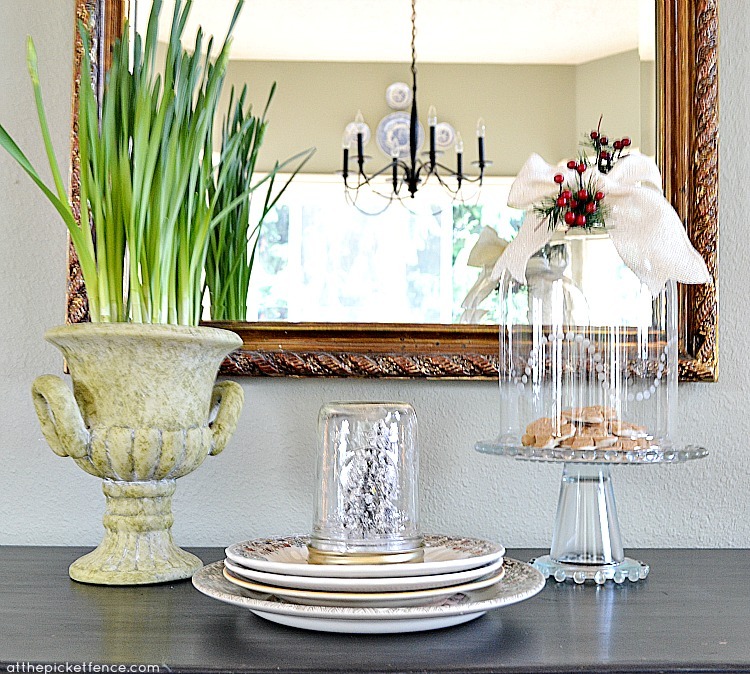 I kept things simple on the sideboard with a silver champagne bucket and cranberries. If you were to venture on further, you would know that you were in the heart of my home. It’s where we do our real living and there you would find a Christmas tree with paper ornaments and a train running around the bottom. Toys are scattered across the floor and crumbs across the kitchen table. A Nativity advent calendar that my children love but isn’t the most…ahem…”attractive” is hanging on the pantry door. 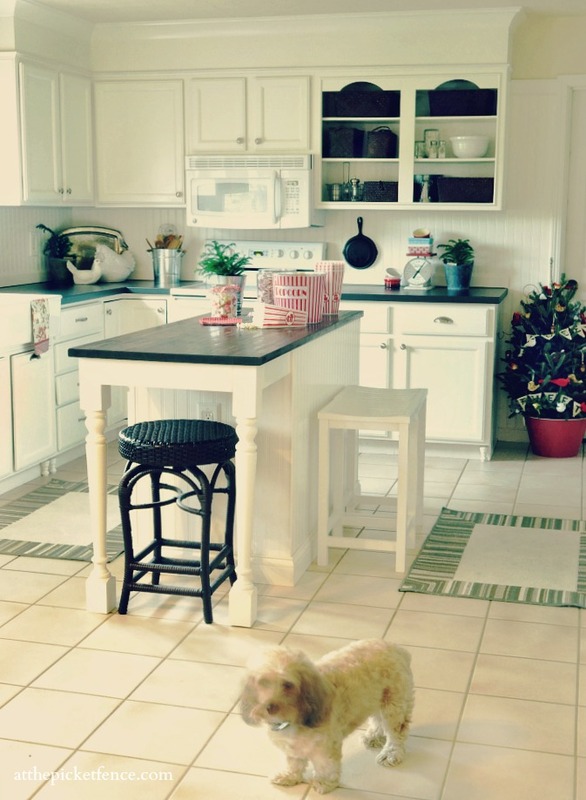 And, as much as I love all of my pretty things I’m showing you here today, that part of the house is my most favorite. So, maybe you’ll have to come back again to see the rest…crumbs and all! 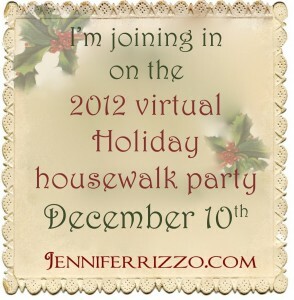 Join us tomorrow as we move onto the next “street” on the 2012 Holiday House Walk where we will be visiting the lovely Beth of Homestories A to Z! We can’t wait to tour her gorgeous home! To see all of the lovely homes on the 2012 Holiday House Walk be sure to visit our hostess, Jennifer Rizzo and thank you for visiting our homes here….At The Picket Fence! 67 Comments on "At The Picket Fence….our Holiday Houses!" Beautiful homes! Thank you for sharing –Merry Christmas and Happy Holidays! I love your homes…they are just beautiful. Wow amazing decor, thank you so much for sharing it with us! Thanks for the inspiration! Two for the price of one! You’ve been busy little elves! Heather – a tree in the bathroom and you know I love that bird tree!! And Vanessa – that bannister is so lush and I love paperwhites! Can’t wait to join you on the house walk tomorrow! Both of your homes are stunning. Natural, traditional and a little whimsy. Tree in a bathroom? Perfect! 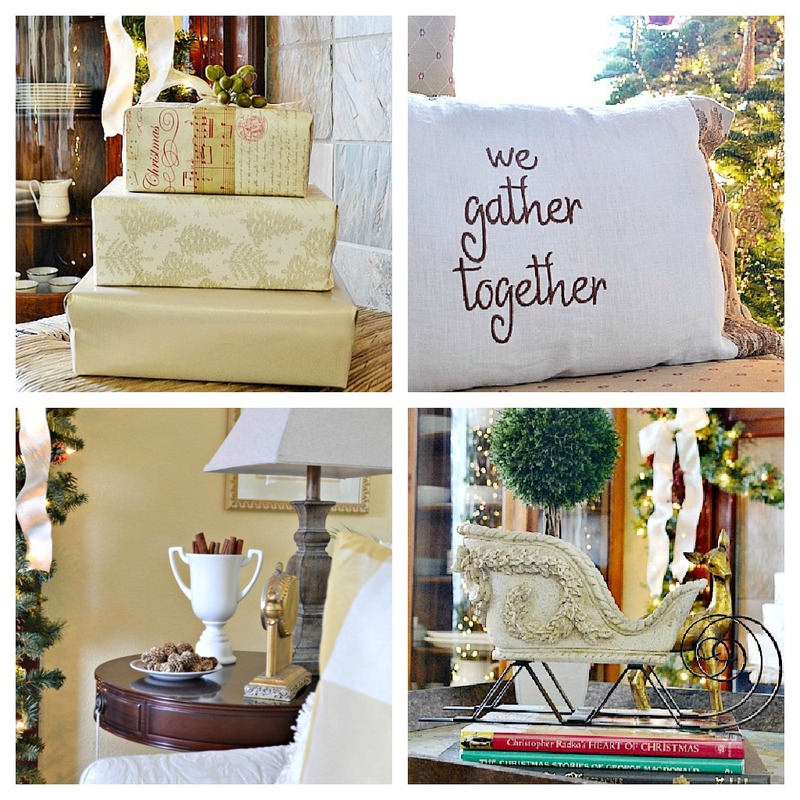 I love each of your styles of Christmas decorating … beautiful! Oh my wonderful creative friends…..it was such a blessing having hot tea with you this morning. And I think I need another cup because I spent so much time over here absolutely *sighing* over your pictures. You are both such a total blessing to me! Merry Christmas to you my wonderful friends! 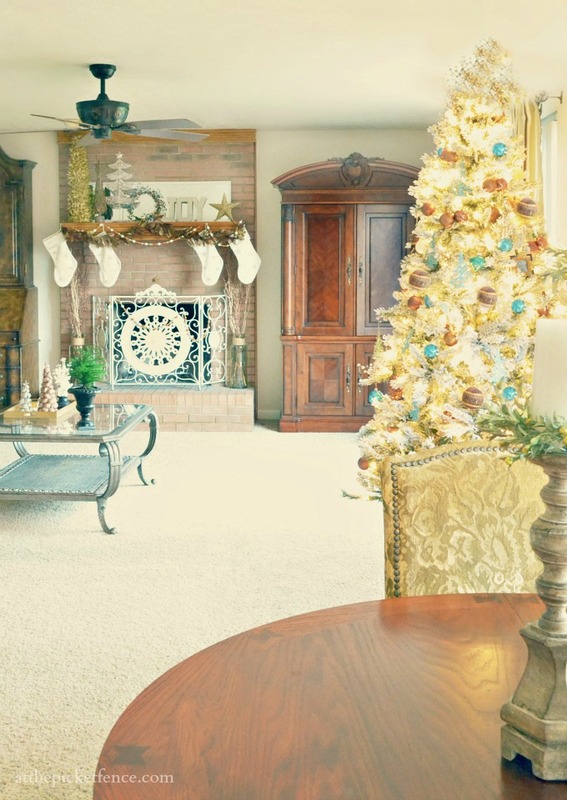 Both of your homes are gorgeous all decked out of the holidays. They both look like they are straight out of a magazine. Merry Christmas, my friends! Oops! Sorry about the previous. Both homes look beautiful. I love your warm and simple style. You’ve both done a beautiful job! I love seeing the little touches you’ve added in here and there. Being in a smaller home now, I’m always looking for those little things. Everything looks so lovely in both of your homes! Merry Christmas! Beautiful! Thanks for “inviting” us into your homes! I’m hoping to see the “real thing” at Vanessa’s this week! And, Heather, I LOVE the tangerine accents in your powder room! Your homes are just gorgeous, I love all the details. Thanks for sharing them with us. What great tours! 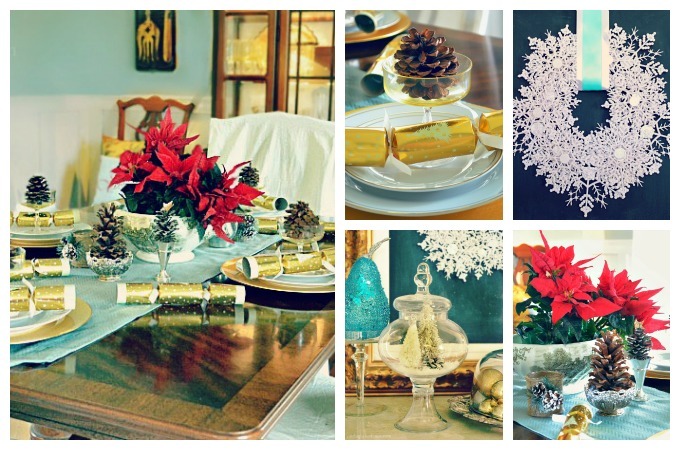 You have both done such beautiful jobs with your holiday decor! Very pretty! Beautiful homes! Your Christmas decorations are lovely. It’s always great to see a fellow KY home! Have a great week! You ladies have such beautiful homes and great taste. Thanks for sharing your Holiday decor with us. I had no doubt that your homes would be beautifully decorated! Just gorgeous! I loved all the fun touches. Great job to both of you! BEAUTIFUL, girls! Love both of your homes so much! I spy a pretty pillow from On Sutton Place, as well. 🙂 Love it all! I’m so excited for these house tours this week! 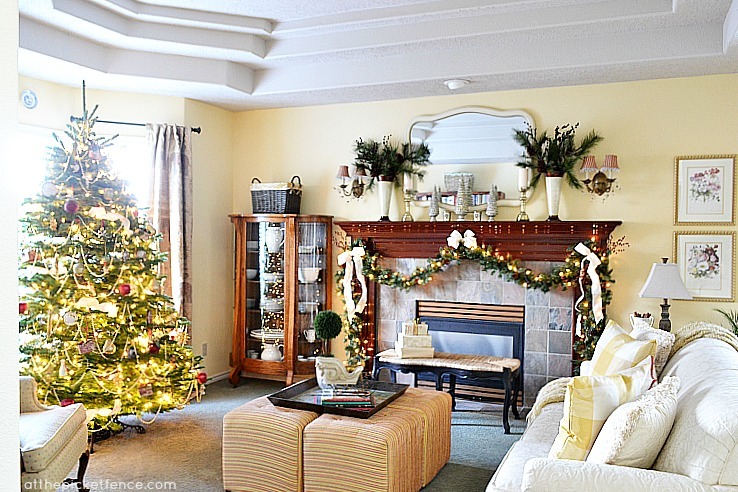 Your homes look gorgeous, very festive and cozy. 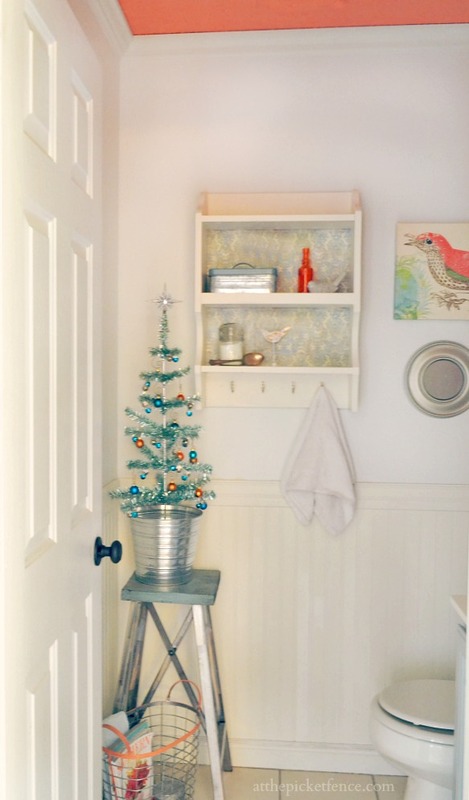 Especially love the tinsel tree in the powder bath! Happy holidays to you both and thank you for welcoming us into your homes. Beautiful, Ladies! Your homes are so pretty decorated for Christmas. Beautifully done you two! Bravo! Both of your homes are just beautiful and they are REAL to me! 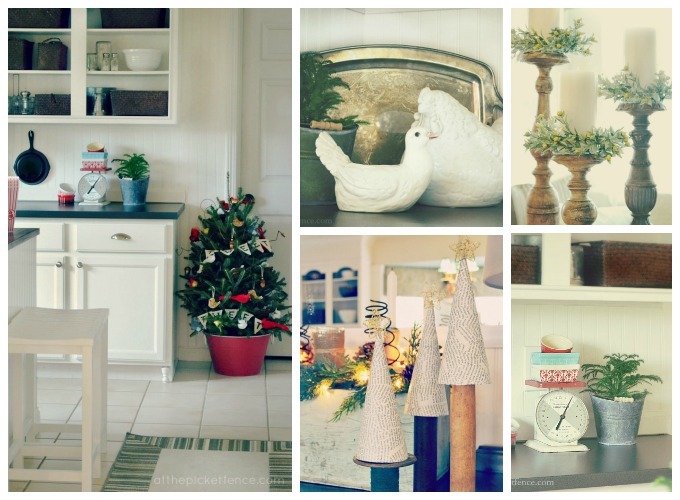 I love the simple touches, little tress as accents and decorating with what you have. Lovely! You both have beautiful home and the decorations are beautiful in each…Happy Holiday! 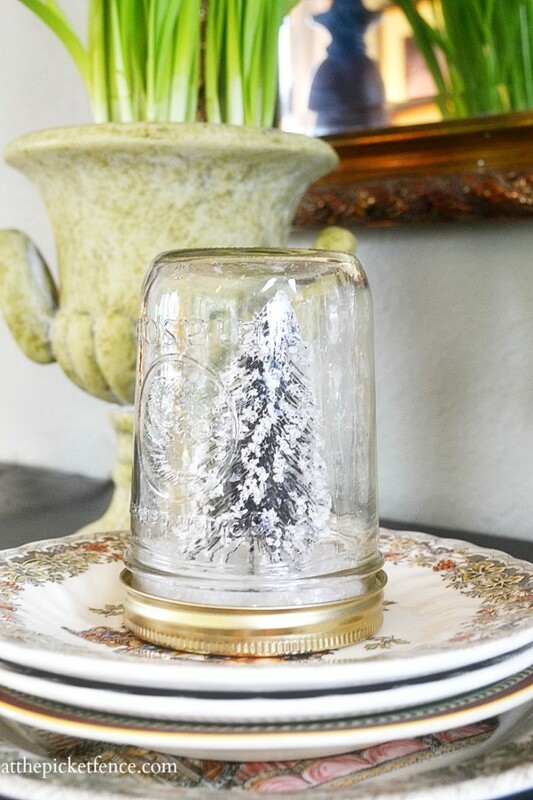 Oh, this is so much fun-just like being on a real Christmas home tour! Both of your homes are beautifully decorated. Wish I had room for a tree in our bathroom, Heather! And Vanessa, those pine cones on your banister are HUGE and impressive! Really lovely photos!!!!!! Thank you for sharing your beautiful Christmas decked out homes! My goodness, your homes are absolutely gorgeous! And your Christmas decorations add to the charm of both. Thank you for sharing your homes. Girls, thanks for the fun tours. Of course, I’ve already seen yours “in person” Vanessa – and I’ll get to see Heather’s in two weeks. So proud of you both for making your homes warm and welcoming to any and all! That’s the most important thing, huh? So glad I don’t have to chose which one of your homes I like better, because they are both so beautiful. 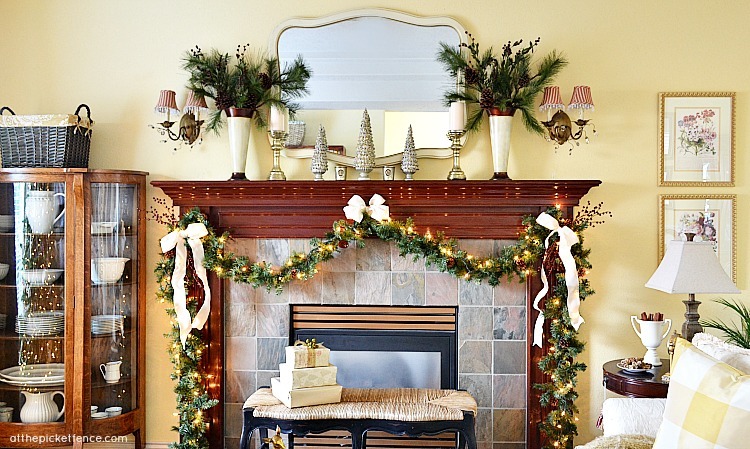 You added just the right touches in each and every room to create some amazing Christmas charm. Thanks so much for giving us a tour. Love it all! Thanks to both of you for sharing your homes with us! I LOVE crumbs. HA I love you home and all the decor but I love that you reminded us all that you have toys and crumbs. I will return. Thanks for allowing me in. *your* sorry for the sp. 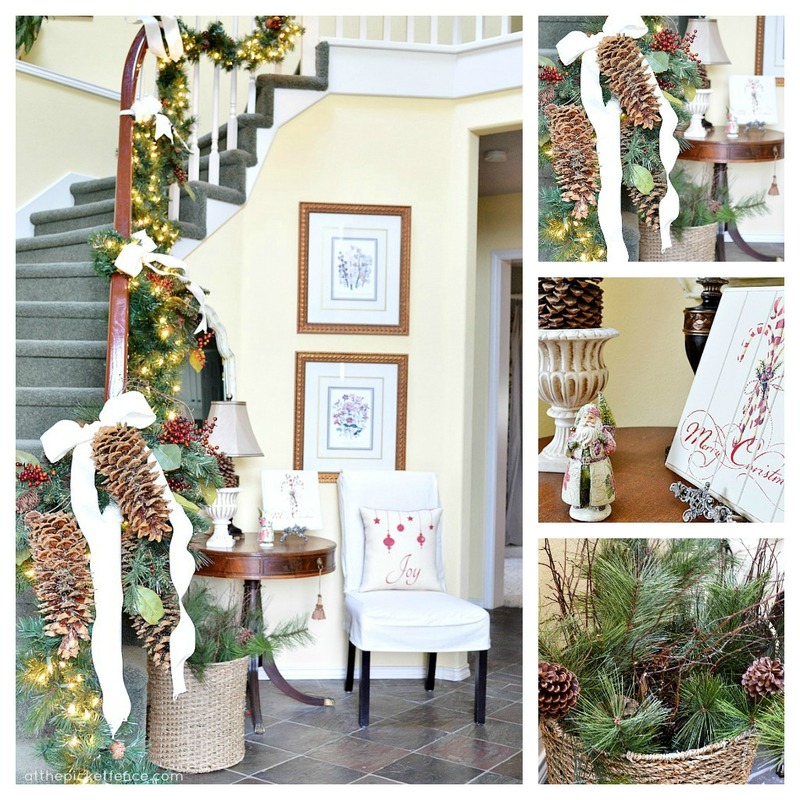 Vanessa…love your entry with the gorgeous staircase…and the pillow on the chair just lets those who enter know that there is true “joy” in your home. Thanks for the wonderful tour!!! Thanks for taking me on the tour…it was so much fun touring in my pj’s. You have both done a wonderful job this year in your homes. Your houses look so beautiful! I so enjoyed visiting your lovely homes today! Thank you–and I am from Kentucky, now in South Carolina–I miss it and my family still there. It can be difficult to keep in touch, so I am glad to see you all have it worked out in such a fun way by blogging. your homes are just gorgeous! Beautiful, warm and inviting! Thanks for sharing with us. Wow, ladies–your holiday homes are just fabulous! Heather, I love your bright powder room with tangerine and blue, and the tureen from Stratford-Upon-Avon–OMG! I just did a Shakespeare audition last weekend, so I am a lover of the Bard:) And Vanessa, what a gorgeous swag you have on your mantel–I love the way you hung it, and that champagne bucket with the cranberries is just perfect on your sideboard. Love it all! Thank you so much for sharing your homes with us!